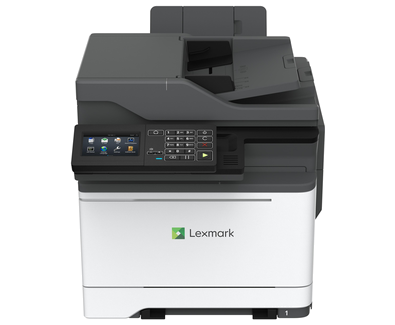 The multifunction Lexmark CX622ade combines colour output at as fast as 37 ppm* with scanning that can reach 94 images per minute for exceptional performance. Lexmark's comprehensive approach to product security is a design and engineering mandate across our entire product portfolio. Our security features help keep your information safe—in the document, on the device, over the network and at all points in between. That’s why Keypoint Intelligence - Buyers Lab honoured Lexmark with a prestigious BLI PaceSetter award for Document Imaging Security***. And this Lexmark product enables you to be GDPR ready. Driven by a 1.2GHz quad-core processor and equipped with a single-pass, two-sided scanner, the CX622ade prints up to 37 pages per minute* and can scan up to 94 images per minute. Its steel frame, long-life imaging system, ease of upgrades and robust paper feeding system provide lasting performance in any environment.